Two City alumni have been recognised for their undergraduate research into topics ranging from Margaret Thatcher to hedge funds. City University London alumni Thomas Buisson (Banking and International Finance, 2014) and Carolina Are (Journalism, 2014) have been named winners at the Undergraduate Awards. The international academic programme aims to celebrate and support the world’s brightest and most innovative students, recognising the best undergraduate research and projects. Thomas and Carolina were selected from more than 5,000 entries from universities across the world to be named the overall winners in their categories. Thomas Buisson was chosen as the winner in the Business category for his research paper, titled ‘The Prominence of Hedge Fund Activism: The Impact of Agency Cost Reduction and Other Strategies on Target Company Share Price Performance’. Thomas had the idea for his dissertation during a 12 month placement at Union Bancaire Privee (UBP) he undertook as part of his degree course. Being named the winner is one of my proudest personal achievements as it represents the culmination of hundreds of hours of dedication and determination. Hard work really does pay off. Carolina Are was named the winner of the Media and Journalism category for her final year dissertation exploring ‘Journalists’ Twitter Coverage of the Death of Margaret Thatcher’. Carolina’s research was awarded the prize for highest achieving dissertation on the BA Journalism course in 2014. "I have been working as a social media manager for my blogs, my start-up and for other companies for a while now, so I'm aware of how social media can make or break a person or a brand. I wanted to show it can be a double-edged weapon for the credibilities and values of journalism." 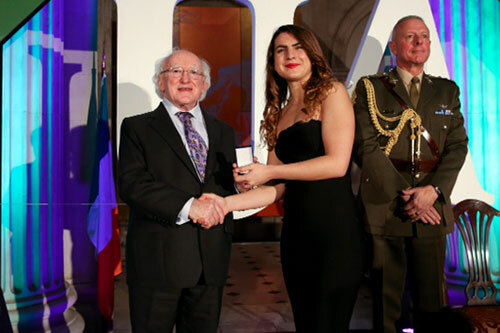 Talking of the award, Carolina said: "I couldn't even believe it when I found out the news - I'd heard about the Undergraduate Awards while I was at City, but winning is something else." 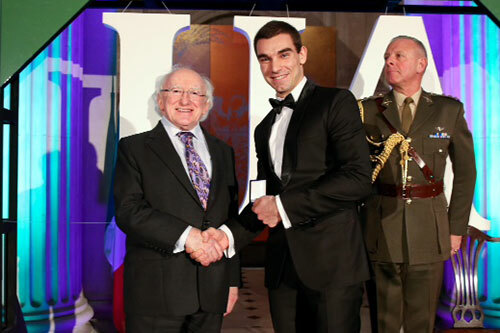 Thomas and Carolina collected their awards at the Gold Medal Presentation Ceremony, held in Dublin’s City Hall on Wednesday 11th November. The event provided students from around the world the chance to take part in discussions, workshops and events to further their personal development, ideas and research. The Summit was addressed by philosopher AC Grayling, physicist Dame Jocelyn Bell Burnell, photographer Giles Dudley, human genome sequencer Craig Venter, and the world’s youngest professor Dr. Alia Sabur, among many more speakers and facilitators.